Have you ever wanted to walk through a painting? How about the illustrations in a story book? 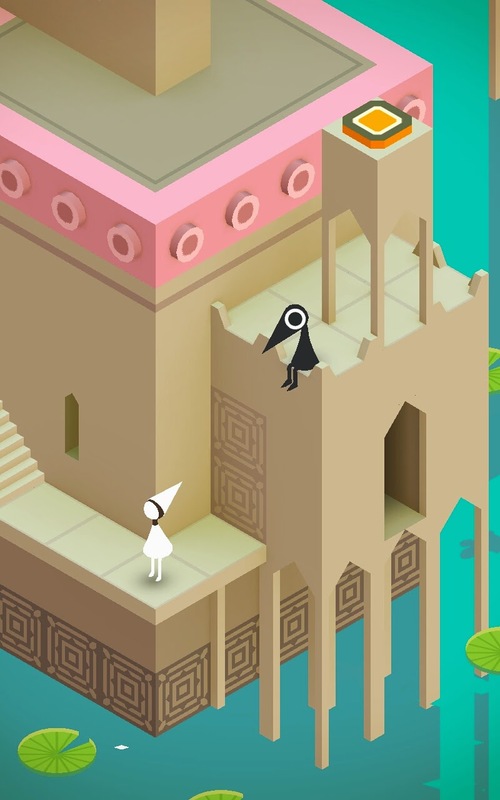 Well, about two weeks ago my lovely sister introduced me to a game that lets you do just that...Monument Valley! 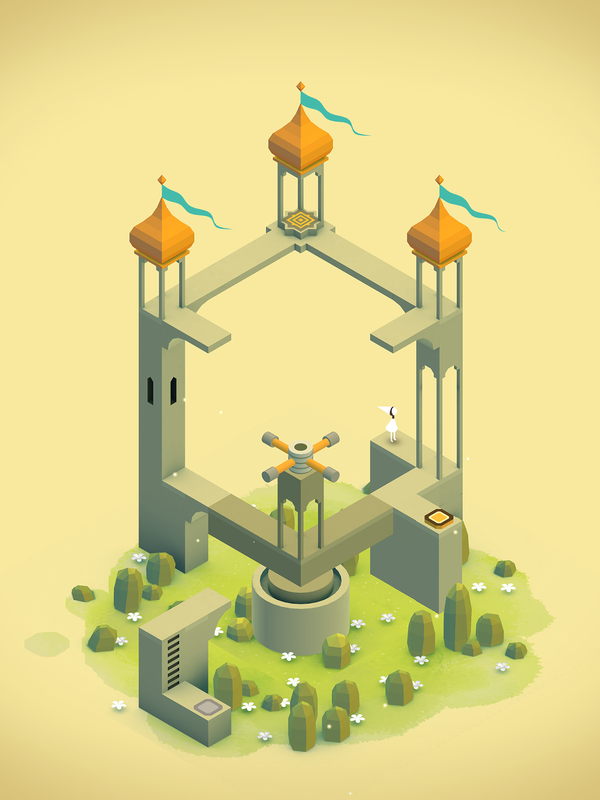 This masterpiece of a game is a mix of beauty and brains, giving the player a feast for the eyes. 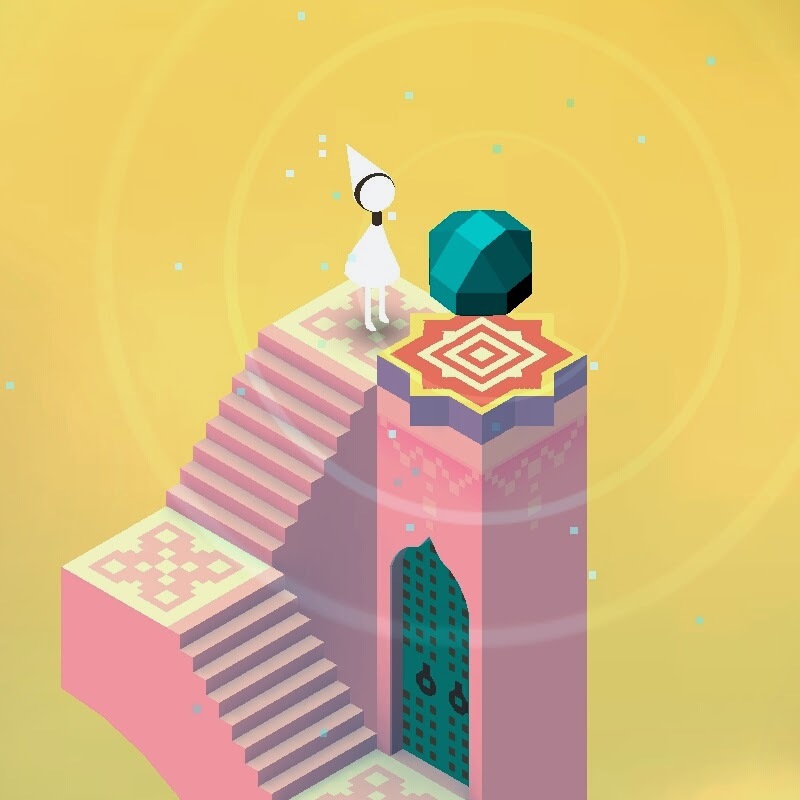 As you go through the levels, you stretch and twist your perspective as you guide the "silent princess" within the 1- 2- and 3-dimensions that make up each scene. Another interesting aspect of the game is that it all feels so intricate and small in stature, like the inside of a Faberge egg. 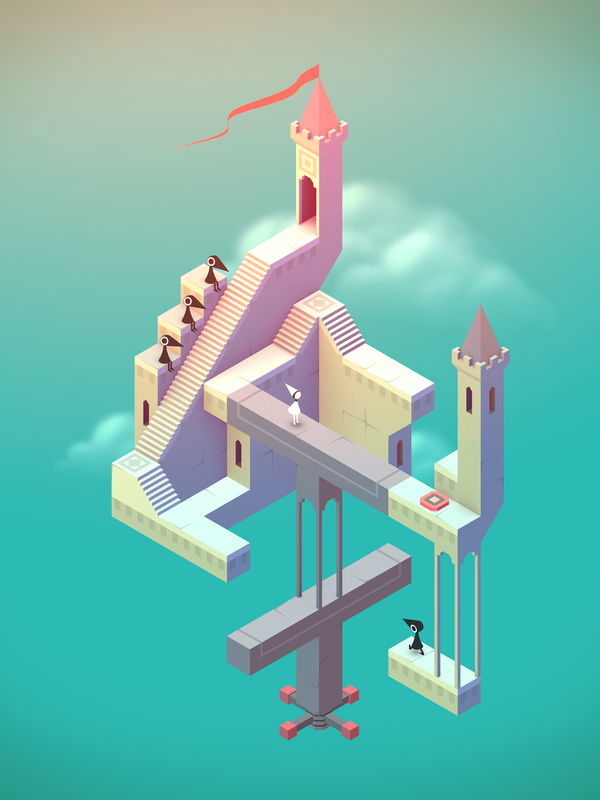 Its so flawlessly made that you could play the game for hours without realizing it. 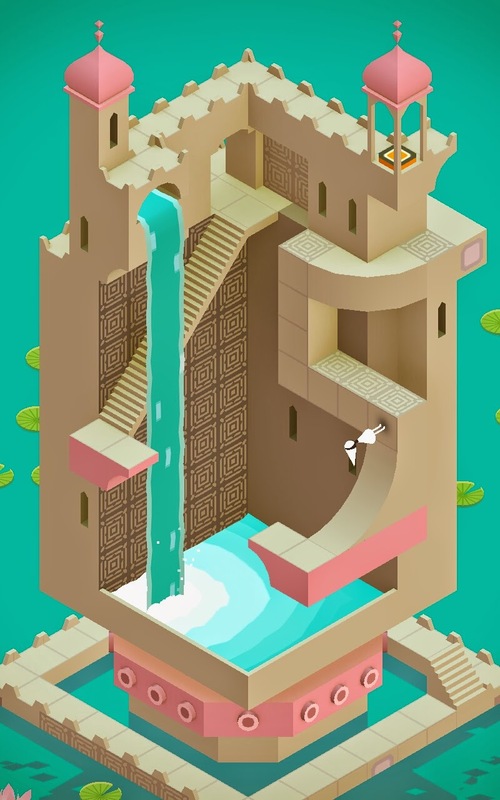 Each level is designed with rich colors and patterns reminiscent of Asian and Mideastern art and architecture. Every level leaves you excited to go on to next one, all of them unique and unexpected. So happy gaming and I hope you find some enjoyment in this little interactive piece of art work! 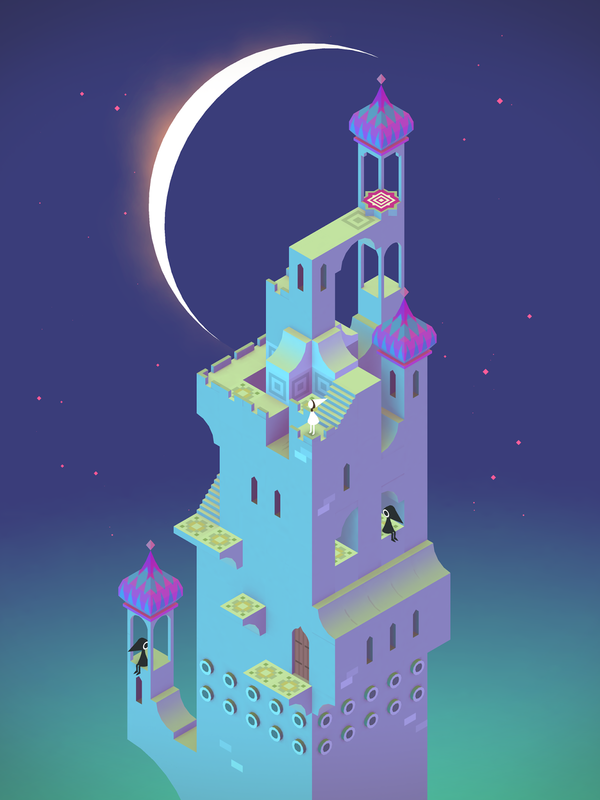 This game is currently available for kindle fire HD and ipad. See it in action below! When I was a kid, I used to read these amazing picture books about a little girl who would walk through the pages of a book, straight into a different time and place...now that I think about it, the girls name was Alice, but it wasn't wonderland she went to! Visiting this large scale exhibition of Thomas Struth's work at the Metropolitan Museum this week, I felt like I was able to become part of the art work. The quiet, mysterious nature of his photos was a welcome to the loud clanging of the city streets outside. 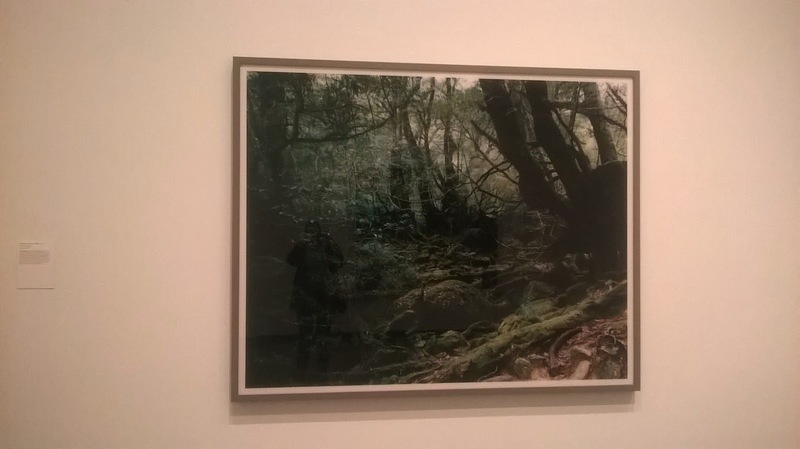 This photo in particular, Paradise 13, depicts the Yakushima forest in Japan. Struth did an incredible job developing the rich contrasts, effectively showing the dark shadows of the trees, the rocks, the dirt. I feel like I can take off my books bag, leave my cares at the picture frame and take a nice, leisurely hike along a road less traveled. Sigh... the problem was, Alice's mirror kept getting in the way. Oh, wait, it was the GLASS that the Met put the photos behind. 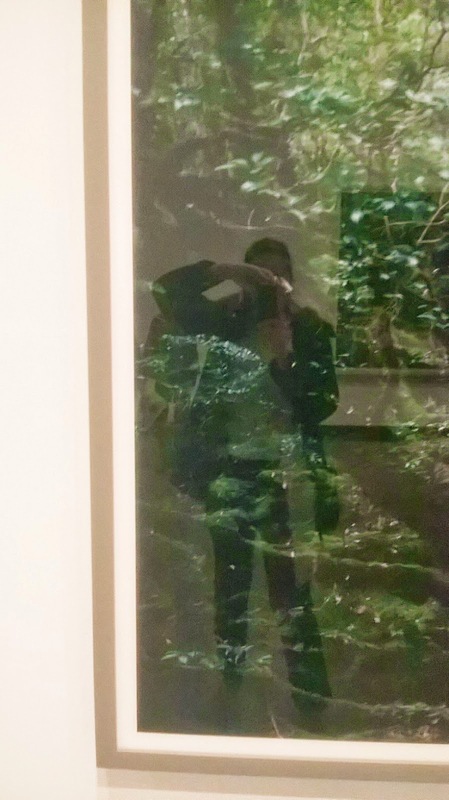 It was so glossy that I had to mentally block out the image of the photo on the wall behind me that was being reflected over the work. I would have much preferred thirty yards of velvet rope and sirens to this. The work was great, but the curator really should have thought this one through. Going to the village of Zichron Ya'akov (which means 'Remembering Jacob') I had no idea that art was so prevalent there. Stumbling upon the Tut-Neyar Paper mill as I meandered along the side streets of this quaint and historically rich place was just an extra bonus to my day.While I had a meaningful and kin-esthetic experience at the Aaronsohn Houses (a.k.a the Nili Museum) that are up the street from the mill, it was a refreshing turn of events to see the beauty that thrives in this community after all that sacrifice. It was good to go from the deep dark history of why this village is so important to seeing examples of how it is alive and flourishing today. You can see where all the inspiration comes from, with that incredibly blue Israeli sky, the plants and trees. Walking up to the place I went by some lemon trees that smelled soooo good. Every moment was pleasing to the senses during my visit here! I happen to LOVE paper. One of my most favorite parts of printmaking in the studio is when I get to handle the different types of paper we use to print on. It helps you realize how art making starts on the surface, not with the image on top. And the paper I saw at this mill didn't even need anything on it to be artwork, or beautiful for that matter! Here are some tidbits of what I saw. Please take some time to visit the mills site (linked above)! There is so much more interesting info. about how they make the paper and the history of the artists who make it! I briefly met Timna Neumann in the store, and she was both kind and friendly. Personally, I think that approachability gives you all the more reason to go and see an artists work... and buy it *wink* (one of my English traveling companions fell in love with some of the hand-sized cards they make here and had to have one). I also found out from Timna that she went to Parsons University here in the NY! It was an added surprise to bring a smile to my day. So, if your ever in Israel, visit Zichron Ya'akov!! It's worth the trip. And don't forget to get ice cream afterwards! Without it your day wouldn't be complete. So, as you can guess from my last post, I've been a little preoccupied for the last two months exploring a new frontier for me... travel! It's been an exciting whirlwind of an adventure, with more surprises and discoveries then I could have ever imagined. When I decided to go adventure-seeking, I never knew how much art would be involved, old and new! As I ran, walked, and stumbled through the land of Israel, I came to one conclusion: this place is a living masterpiece! I found beauty and mystery everywhere I looked. Mountains and valleys rise and fall majestically here, and even the most hum-drum village is worth pulling out your camera for. Here is a view I had of the Jezreel Valley from the Muhraqa Carmelite Monastery on Mt. Carmel in Northern Israel. The next couple of posts will be about some of the interesting and thought-provoking artwork and places that I was able to experience on my adventure. Some of it is contemporary, other things historical, but all of it is so cool! I'm so excited to share it with you! Outside of Rembrandt, Villers takes the cake for portraiture for me. She had a sharp eye for capturing light and feeling in her paintings and, quite frankly, she doesn't get enough credit for. 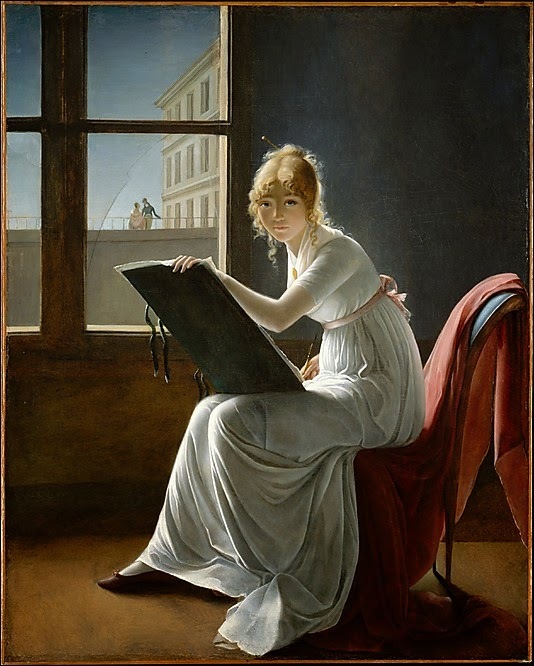 I mean, the lady's work was credited to her teacher, Jacques-Louis David for most of her lifetime! As an artist, the very thought makes my skin crawl. Everything, from the hem of her gown to the crack in the window is made with incredible care. She was certainly a master in her own right. In fact, she was an observer of common life way before the impressionists took up that task. Her paintings of water maids and peasant women and children are both romantic and heart rendering at the same. She took time for them while the masters around her were still depicting Roman and Greek mythology. While her painting style is very different, her work seems kindred to that of Jean-Francois Millet, decades later. Both emphasized a respect for the people they were rendering. With all the snow pouring down here in NYC, I find myself reminiscing about the hard treks I used to take with my mom downtown. Wrapped in the most uncomfortable snow suits imaginable, the snow transformed me into a living breathing snowman! I chose this next VFFT piece because it encapsulates nostalgic NYC with a heavy touch of impressionism. Guy Wiggins was an artist who lived from 1883 to 1962. I thought that was pretty cool because he was able to live out the last two decades of the 19th century and experience all the advancements of the 20th century as it progressed. He lived through both world wars and millions of structural and cultural transformations to this city, and to the world. If any artist had something to paint about, it was him! 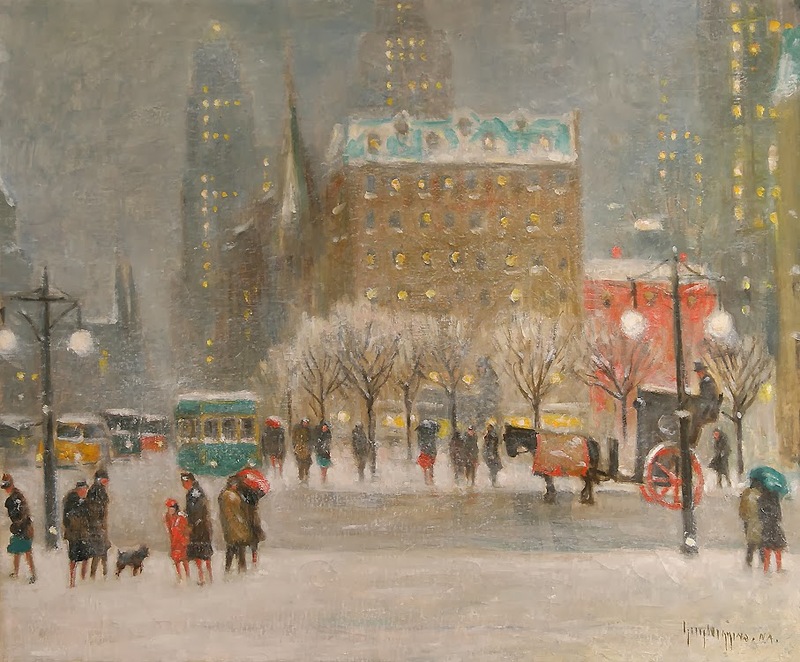 Looking at this painting, you can feel the wet, the cold, and the wind rustling the coats of the passerby's. When I saw this painting (previously located at REHS Galleries, inc), I immediately recognized the Plaza Hotel (popularly known as the home of the fictitious Elois!). Its shows the rising skyline around this grand building, successfully incorporating an older world with a blossoming new metropolis. I've walked by the Plaza many times in my travels. The whole area around it really takes you back to a different time, with a open square surrounded by horse and carriages. One block over and your back to the 21st century. sigh... too bad I have to take the train. Tweet or facebook me your opinions on this piece, or any other you would like to discuss! 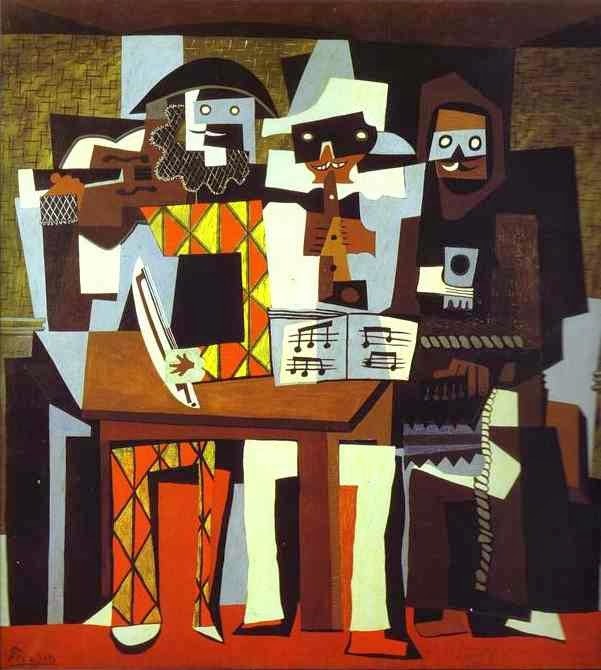 When I was younger, one of the first "abstract" artists I ever learned about was Pablo Picasso. His work was both odd and exotic to me. 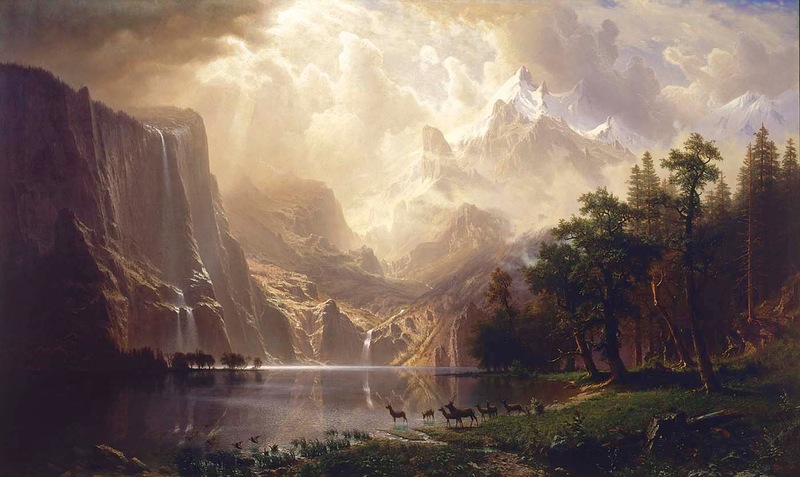 Now that I am more developed as an artist myself, his work doesn't seem so alien and impenetrable. In fact, the cubist attributes of his paintings are both interesting as a subject matter and as a storytelling device to me now. Yes, learning to understand the meaning behind his abstraction methods has made Picasso a more esteemed artist in my own opinion. Looking at the three musicians at the table, you can almost feel the music bouncing off of every angle, every pointed knee and squared off elbow. Look how they are all squeezed side by side, united as one entity, one object instead of three. How can they play when stuck together like that? It makes you think the music must be quick, squeaky, sharp at times... a lively tune! Each man, mustached and debonair, giving his best performance, stuck in the middle of the frame. This beautiful piece of work is currently at the Philadelphia Museum of Art. One of the many patterns that a viewer can observe in art is the making and re-making of self portraits by certain artists. Some of us barely make them ,while others make it a weekly habit (I know a few of those myself)! 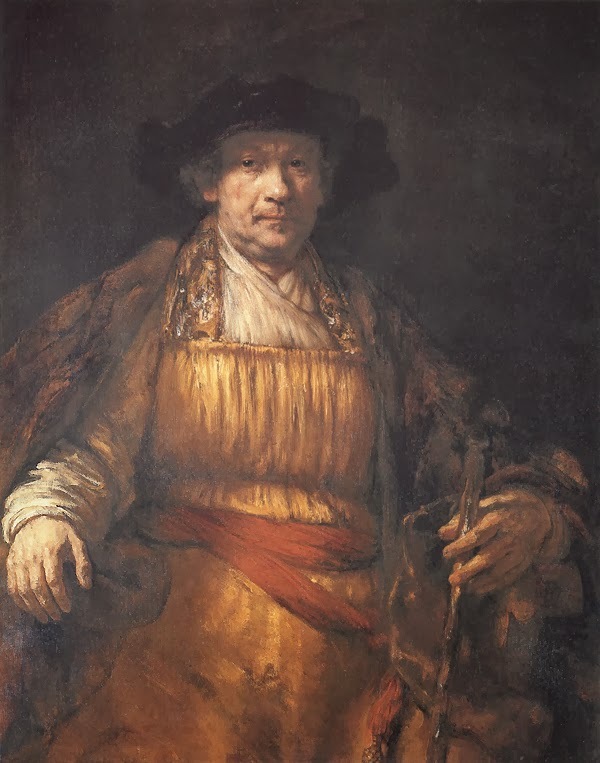 As for me, there is one master whose portraits I could stare at for hours on end, and that's...Rembrandt. I went to the Frick about a month ago (you can read about it here ) and came across this one, entitled Self Portrait 1658. For me, Rembrandt's portraits have something really special about them. 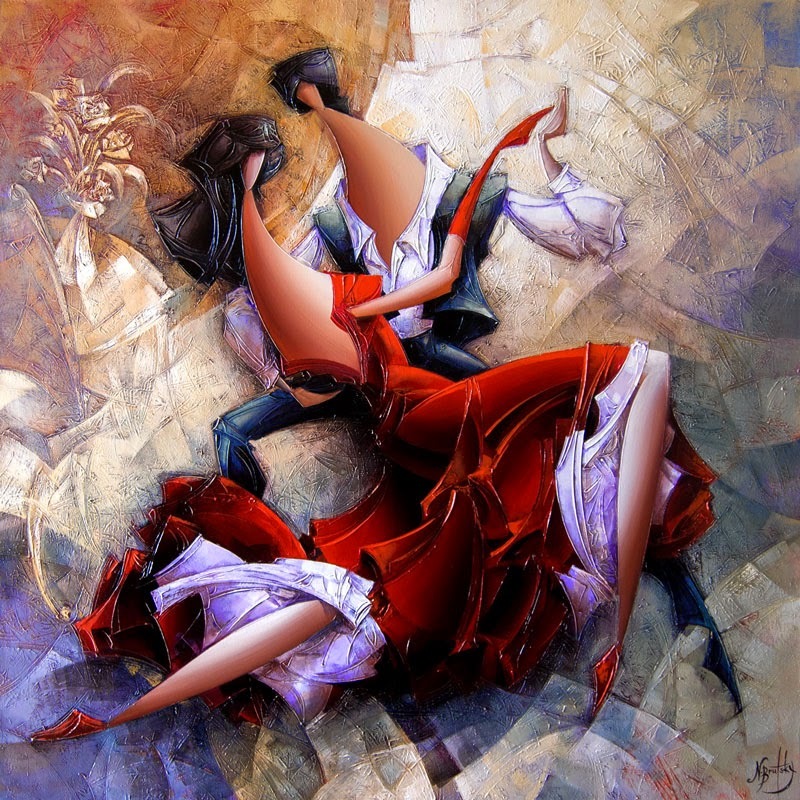 Whether it's himself or another subject, the figures pull you into their world. There's a few ways that he makes this happen. First and foremost, his eyes. You can never really tell from a photograph, but when you stand in front of this picture, the soulfulness, the age, understanding, and regrets of life come through his eyes. Secondly, the luminosity of his figure against a warm, dark background makes him look so living, as if hes captured little bit of his own body temperature and stuck it between the folds of his garments. While some artists have shied away from showing the signs of age in their portraits, Rembrandt gives you a (seemingly) honest look of his features. While he is quite stately, his face shows the signs of a life fully lived, with imperfections in the skin and even a light scar on his cheek. His hands are not smooth like a young mans, but angular. He is even holding what looks like a walking stick, a true sign of well earned age. This painting alone is worth making a trip down to the Frick! If your not in New york, try finding some dutch master works in your local museum (if you have one). If not that, look online! Please leave any comments below, or on the NYCImpressionista facebook or twitter page (links on sidebar). Kandinsky in Paris, 1934–1944, an exhibition now showing at the Guggenheim, explores the art work of Vasily Kandinsky during the 11 years he lived in France, after the Nazi shut down of the Bauhaus school in Germany. 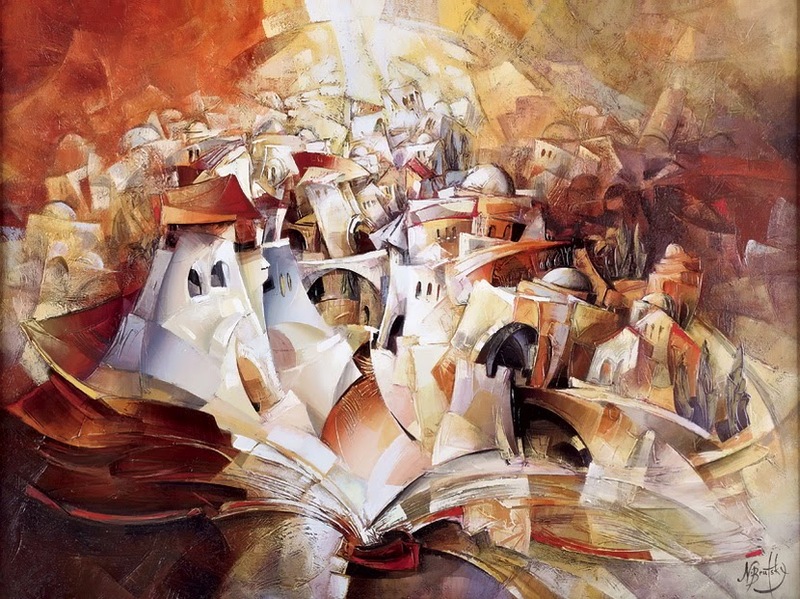 There are very few abstract artists whose work I would care to search out. As an artist myself, I have dragged my feet when it comes to analyzing this type of work, for one reason or another. But, last year I was first introduced to the work of Vasily Kandinsky by a friend of mine and realized that there was abstract art that I could enjoy! The work above is as large as the average human wingspan, full of rich colors, textures, and...surprisingly to me, light. Light is the last thing I would expect when I look at abstract art. He made this work with oil paint and SAND on canvas, which I thought was pretty cool. The shapes dance on a glowing background, each one interacting with the other. In the words of Anne Shirley (my favorite fictitious heroine), Kandinsky work contains a lot of "scope for the imagination!" 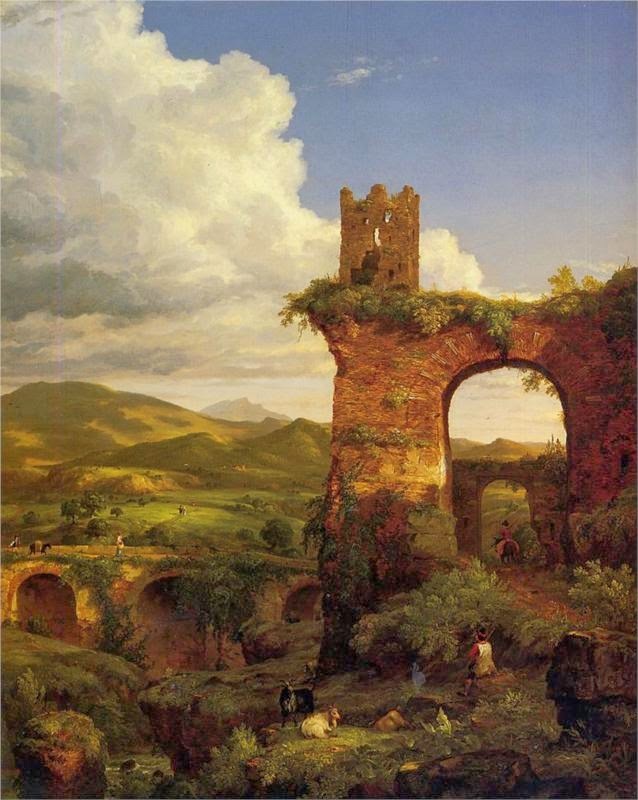 This work in particular was made during his time in France, at the end of his life. I have to say that the work from this time in his life strikes me as the most beautiful and well formed out of all his work. Looking at an artists work is a lot like looking at a bottle of aged wine. You hope that it holds the finest product of that artists life. I think that this exhibit shows how Kandinsky succeeded in this! 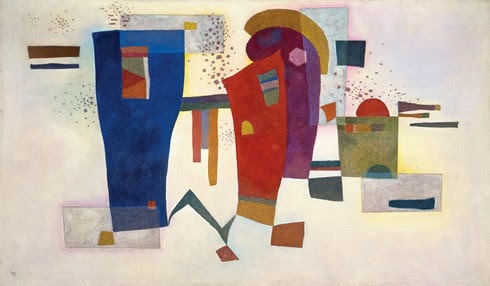 Any comments about Kandinsky's work? What about the show at the Guggenheim? Leave any comments below or on my facebook or twitter!